Canopy w/ Boot, 49 gallon Fuel Tank, Rail Frame Anodized, Fixed Ski Tow Bar, Anodized Rail Frame (Black), Captain's Chair Upgrade, SS Cupholder, Stern Table, Hydraulic Sea Star Steering w/ Tilt Wheel, Stereo MA300 Bluetooth/App Ready/AUX/USB 4 Speakers, Upgraded Helm Door (Black). Convenience Package: Docking Lights (LED), Stainleess Steel Rubrail, SS Cupholders. Preferred Option Group: Boat Cover, Dual Battery Swtich, Changing Room w/ Curtain. 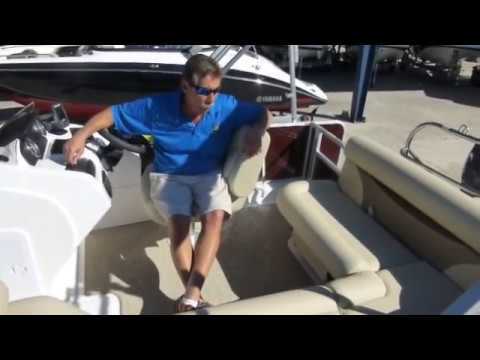 Scroll over to watch a video walk-through of a FunDeck 226, please note that the video may showcase a boat that is one to two model years older, but it's a great way to see the basic features of the boat in action!